After a tragic year of loss, PAWS foster dog Burgundy came into the lives of PAWS Development Board Member David Klaskin and his two daughters, 11-year-old Lily and seven-year-old Katie, at a time when they needed her most. Princess is one of PAWS Chicago’s Foster First dogs. 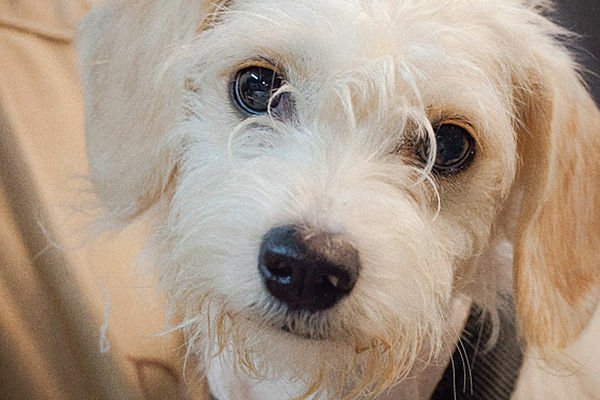 The Foster First foster-to-adopt program was started late in 2015 in response to the epidemic of Canine Influenza Virus (CIV) that hit Chicago last year. CIV is a flu, not a life-threatening disease, but dogs who have it are contagious for up to 30 days. During that time, they can easily spread it to other dogs. Foster First dogs are nearly ready for adoption, but first need a little extra time and TLC as they recuperate from CIV or wait out the period during which they may be shedding the virus, even if they don’t have any symptoms. PAWS’ Foster First program gives these sick or potentially contagious dogs a chance to heal in a loving environment while opening up much-needed spots at the PAWS Chicago Medical Center so more at-risk dogs can be saved. Many animals are sitting at the city pound, uncertain of their fates. The more animals PAWS can take in, the more lives can be saved. While it may be a bit harder to foster a CIV-exposed dog, it’s also an incredibly rewarding experience. To avoid spreading CIV, Foster First families must have no other dogs in the residence and must keep their dog away from other dogs during walks. The program also gives prospective adopters an extended time to get to know their new pup. Once the foster dog is medically cleared, the official adoption can take place. The Foster First program is the newest addition to PAWS’ robust foster network. Foster families open their homes to care for sick and injured pets or animals having trouble adjusting to shelter life. In 2015, more than 2,800 PAWS animals spent time in foster care, and many resulted in wonderful stories like that of Princess.